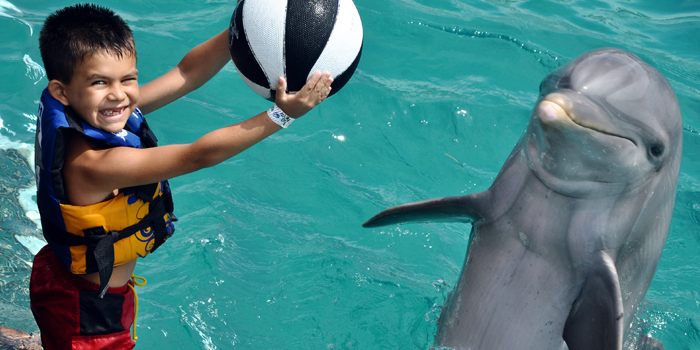 Isla Mujeres, located in Cancun, Mexico, offers the opportunity to swim with dolphins in their natural habitat. The foot push, dorsal tow, handshake, hug, hand target, and kiss are all featured to enhance your dolphin interaction experience. Reasonably priced packages, top-notch VIP service, and the Beach Club await you at Isla Mujeres. 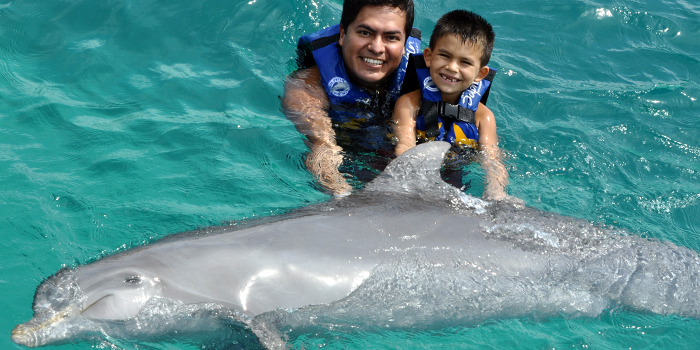 Isla Mujeres has a maximum of ten people for dolphin experiences to guarantee a personalized and unique experience to all guests. 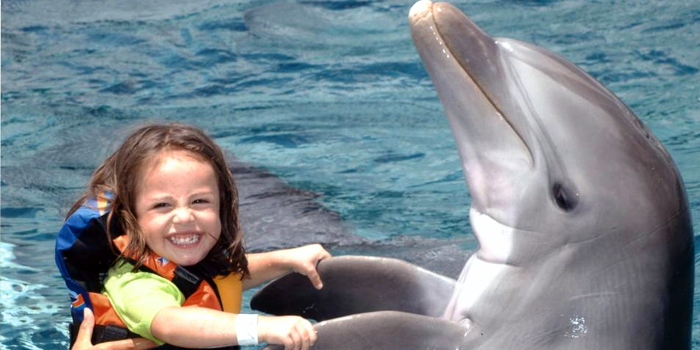 The Dolphin Royal Swim VIP package includes the foot push, dorsal tow, handshake, hug, hand target, and kiss behaviors throughout your dolphin swim experience. 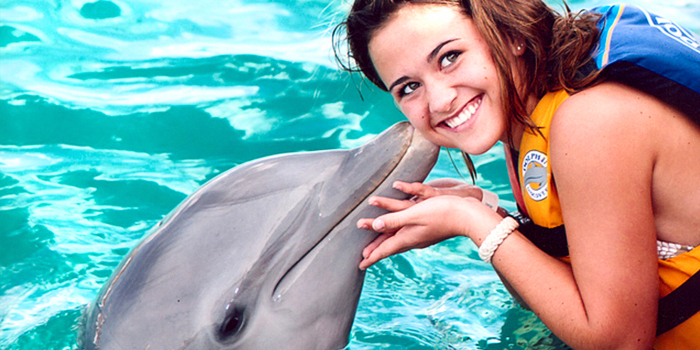 A continental breakfast, an open bar, and lunch buffet are also included for before and after your dolphin encounter. Additionally, there is an included bicycle tour which will give you a new perspective on Isla Mujeres and the diverse species it houses. Please be sure to arrive thirty minutes before your program to ensure time for the briefing. Also, be sure to bring lots of biodegradable sunscreen to protect yourself from the sun and the dolphins from chemicals. Don’t forget the towels and cash for any miscellaneous charges, such as taxis or meals. 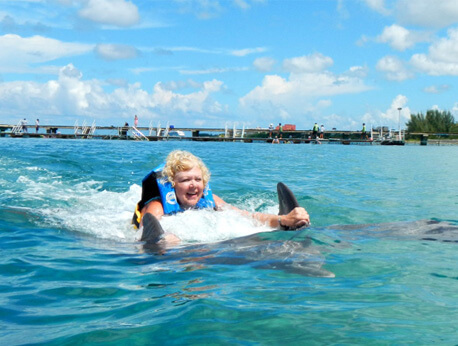 Please note that photos of your dolphin experience, the ground transportation fee, additional activities, and the dock fee are not included in your package. For safety reasons, pregnant women are not allowed to part take in any of our aquatic programs. Kids between 3' 11" and 4' 7" must participate with a paying adult.